Arasta is taken from the old word Persian word ‘Araste’ which describes the part of a mosque which in the olden days would have been where market traders plyed their trade. Obviously in more modern times things have changed and it is now used more freely to describe a general market area. In the case of Lefkoşa, the Arasta area is one long main street with several intersections and ends up at the Lokmacı Border Crossing which takes you into Ledra Street in the south. In the more recent history of Cyprus the temporary division of the two Cypriot communities happened here in 1958, right in the heart of the city with the final divide in 1974. Walking along Arasta you will still see the divide, but thankfully the two communities finally managed (after a certain amount of arguing!) to open a checkpoint at the Lokmacı end. Nowadays Greek and Turkish Cypriots shop on both sides of the border, giving hope that at least the everyday Cypriot has no problem with his Turkish or Greek counterpart and that it just hopefully politics that separates the two communities. 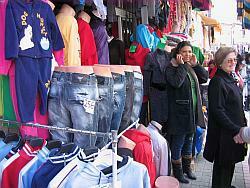 Check our article on Visas & Permits for North Cyprus article for more information on border crossings. 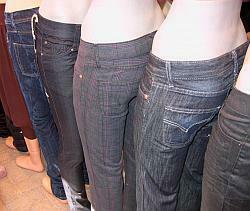 There are any number of items to buy here, with the typical array of ‘genuine’ fake branded jeans, bags, shoes and other textiles to take your pick from. Some very good bargains are to be had, and you can also haggle if you want too – there is no offence taken by the proprietor! 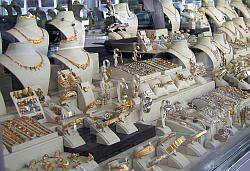 There is also a myriad of jewellery shops to purchase various temptations in the forms of gold, silver and stone. Perhaps you might like some Cypriot souvenirs to take back home for presents, in which case you can choose from handcrafted items such as decorative plates, colourful weaved Cypriot mats and rugs, the traditional glass ‘evil-eye’ to ward off bad spirits or perhaps even a belly dancing outfit with its shiny coins to impress family and friends back home with! 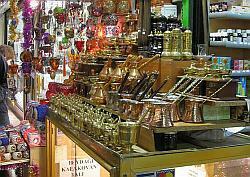 There are in fact many different kinds of shops in and around the Arasta area, from clothing and jewellery to antiques and authentic Cypriot artefacts, to the every day typical high street shop selling household goods, electronics and the like. Not actually part of Arasta but located just to the side is the Bandabuliya which is the municipal market area in Lefkosa. Take a look in here if you want to sample some of the locally grown produce, or buy some sweet delicacies such as Turkish Delight or Lokma. 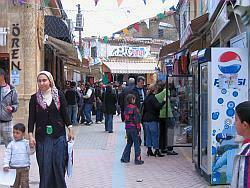 Also don’t forget the various cafes, bars and restaurants for that all important shopping pit-stop! Arasta is a vibrant part of city life in Lefkosa but you will find many of the islands fascinating sights in Lefkosa, just a minutes walk away from the shopping area, so even if you fancy a break from shopping there is still plenty to keep you occupied! However if you still need a shopping fix (and why not!) then you can also do some cross border shopping to South Cyprus or perhaps you are looking for something in particular, in which case you may find what you are looking for within our shopping in North Cyprus article!